Nantucket's other "town" (a village, really) is a great destination for a bike ride. Almost everyone who gets to Nantucket for a few days takes the opportunity to ride a bike 7 miles (11 km, about 1 hour; map) to the village of Siasconset (called nothing but 'Sconset by islanders) on the island's southwestern side. 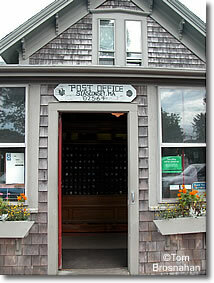 The village center consists of Post Office Square, a roundabout on which you can see the post office, 'Sconset Café and "package goods" (liquor, wine and beer) shop, Claudette's Sandwiches, the Siasconset Market—good for a fresh-cut sandwich or an ice cream cone—and the tennis courts of the Siasconset Casino (tennis club). To the right of Claudette's is the road to the beach, only 100 yards/meters away. There are no facilities whatsoever on the beach. Public toilets/rest rooms are a block north from the market, near the old town pump. The rest of 'Sconset is residential, with many typical Nantucket houses, but also a few streets of small, low-roofed bungalows, some more than two centuries old, that sit squatly and squarely as though bracing for the violence of winter storms. Want a walk? 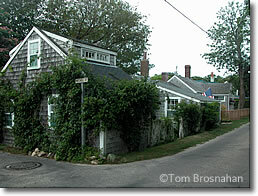 Look for narrow Front Street east of the 'Sconset Market, walk along it almost to Broadway and turn left onto Bluff Walk for a stroll with sea views. NRTA Shuttle buses will take you to 'Sconset, but the most enjoyable way to go from Nantucket Town is by bicycle along Milestone Road and its bike path (map). Once in 'Sconset, walk around and admire the little old houses, have something to eat, go to the beach, take a walk or ride your bike around.